← Announcing the Koons 2012 Biggest Loser Challenge!! We’re barely into the new year and already 2012 is heating up for Ford Motor Company. 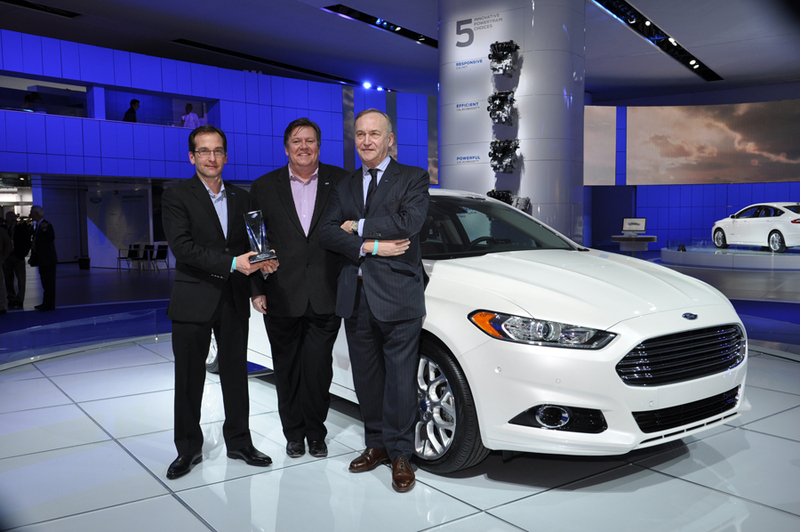 After its debut, the 2013 Ford Fusion has won the “Eyes On Design” Award for Best Production Vehicle at the 2012 North American International Auto Show in Detroit. The 2013 Ford Fusion features an all-new design mixed with what’s predicted to be best-in-class Gas, Hybrid, and Plug-In efficiency and seven must-have technologies such as Adaptive Cruise Control and Active Park Assist. With such a stunning design, it’s no wonder that the 2013 Ford Fusion was the clear winner. If you haven’t seen it yet, visit our 2013 Ford Fusion photo gallery on Facebook. Posted on January 19, 2012, in Auto Show, Automotive, Ford, NAIAS and tagged 2013, awards, Best Production Vehicle, design, Detroit, Eyes On Design, Ford, Fusion, NAIAS, North American International Auto Show, styling. Bookmark the permalink. 2 Comments. The biggest change for the new Ford Fusion is the grille. Looks very Aston Martin’esque and gives the car a more upscale and elegant vibe.